The Staff Picks Bundle has returned once again to Humble. 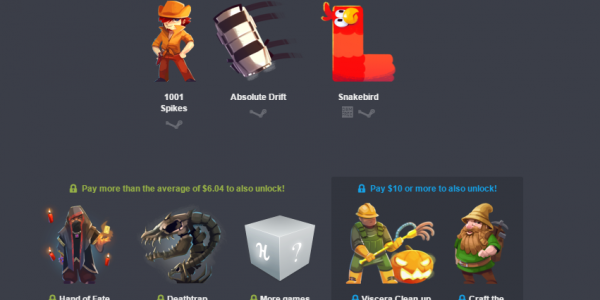 Staff Picks is a relatively new type of bundle at Humble Bundle. The first one of these debuted in April, and the games were picked by the office’s gargoyle. Now it’s Hamble’s turn, the office’s bindle pig. Hamble’s taste is somewhat eccentric, as demonstrated by the choice of games in this bundle. The Pay What You Want tier gets you 1001 Spikes, Absolute Drift, and Snakebird. Beating the average, currently at $6.04, adds in Hand of Fate, and Deathtrap. If you pay $10 or more, you get Viscera Cleanup Detail – including the House of Horror DLC, as well as Craft the World. You can also pay $40 for a plushy. See everything for yourself through the link. This bundle will be live for the next 13 days and more games will be added soon.